For decades, commercial lithium production relied on mineral ore sources such as spodumene, petalite and lepidolite. However, extracting lithium from these sources is significantly more costly than extracting the metal from lithium-containing brines. In fact, the cost of extracting lithium from hard rock is estimated to be double that of producing from brines, explaining why most of these sources have been priced out of the market since the early 2000s. Salar brines can be described as underground reservoirs that contain high concentrations of dissolved salts such as lithium, potassium and sodium. These are generally found below the surface of dried lakebeds known as salars. Lithium is traditionally processed from brine, spodumene and clay. But there are new forms may make extraction easier as technology continues to develop. Lithium is a metal commonly used in batteries like rechargeable ones, those found in laptops, cellphones and other digital devices. The metal is also used in aircraft manufacturing and for certain mental health medications. When made into lithium carbonate, it can treat bipolar disorder. It was first discovered 1817 by Swedish chemist Johan August Arfwedson. Arfwedson, though, wasn't able to isolate the metal when he realized petalite contained an unknown element. In 1855, British chemist Augustus Matthiessen and German chemist Robert Bunsen were successful in separating it. It is one of the lightest and softest metals known to man. In fact, it can be cut with a knife. And because of its low density, lithium can even float in water. Most of the lithium found today is extracted from brine reservoirs located in regions of southwestern South America and China. 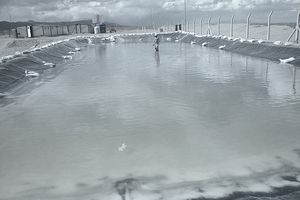 In order to extract lithium from brines, the salt-rich waters must first be pumped to the surface into a series of evaporation ponds where solar evaporation occurs over a number of months. Because salar brines occur naturally at high altitudes — and in areas of low rainfall — solar evaporation is an ideal and cost-effective method for precipitating salts. Potassium is often first harvested from early ponds, while later ponds have increasingly high concentrations of lithium. Economical lithium-source brines normally contain anywhere from a few hundred parts per million (ppm) of lithium to upwards of 7,000 ppm. When the lithium chloride in the evaporation ponds reaches an optimum concentration, the solution is pumped to a recovery plant where extraction and filtering remove any unwanted boron or magnesium. It is then treated with sodium carbonate (soda ash), thereby precipitating lithium carbonate. The lithium carbonate is filtered, dried and ready for delivery. Excess residual brines are pumped back into the salar. In contrast to salar brine sources, extraction of lithium from spodumene and other minerals requires a wide range of hydrometallurgical processes. Because of the amount of energy consumption and materials required, this is a much more costly process than brine extraction, even though these deposits have a higher lithium content. That's why this process nets a much lower yield of lithium production per year. Galaxy Resources, which mines spodumene at Mt Cattlin in Australia, first crushes and heats the ore in a rotary calcining kiln to convert the lithium crystal phase from alpha to beta. This process is referred to as decrepitation. It allows the lithium present in the ore to be displaced by sodium. The resulting spodumene concentrate is cooled and milled into a fine powder before being mixed with sulphuric acid and roasted again. A thickener-filter system then separates waste from the concentrated liquor, while precipitation removes magnesium and calcium from this solution. Finally, soda ash is added and lithium carbonate is crystallized, heated, filtered and dried as 99% pure lithium carbonate. There are many approaches possible for extracting lithium from clays. The choice of which approach to follow depends upon the nature of the specific raw material being considered. Although many lithium extraction processes have been used, most of the current processes have been developed for pegmatite raw materials and may not be completely effective for extracting lithium from clay feed material. Bureau of Mines studies have investigated lime-gypsum roast and chloride roast for lithium extraction from spodumene and amblygonite. Techniques being explored for extracting lithium from clays include water disaggregation, hydrothermal treatment, acid leaching, acid baking-water leaching, alkaline roasting-water leaching, sulfate roasting-water leaching, chloride roasting-water leaching and multiple-reagent roasting-water leaching. However, despite the testing, clay has not yet proven to be cost viable and is not being done commercially. In the end, extracting lithium from brine is cheap but slow. Extraction from spodumene is expensive but fast, while processing of clay is not yet commercially proven at scale. There are disruptive new lithium extraction technologies being looked at including leaching, solvent extraction, geothermal extraction and electrolysis, but the findings are too inconclusive to be used commercially. Using seawater. Lithium also exists in our oceans. There are currently processes in place to extract the metal from seawater including the co-precipitation extraction process — which involves separating lithium from other ions present in the water. But newer forms of technology are still being developed to make the process easier. Using recycled electronics. Although this isn't necessarily a form of extraction, it is an easy way to add to the world's lithium sources. Converting lithium into metal is done in an electrolytic cell using lithium chloride. The chloride is mixed with potassium chloride in a ratio of 55% lithium chloride to 45% potassium chloride in order to produce a molten eutectic electrolyte. Potassium chloride is added to increase the conductivity of the lithium while lowering the fusion temperature. When fused and electrolyzed at about 450° C, chlorine gas is liberated while molten lithium rises to the surface of the electrolyte, collecting in cast-iron enclosures. The pure lithium produced is wrapped in paraffin wax to prevent oxidization. The conversion ratio of lithium carbonate to lithium metal is about 5.3 to 1. Although Chile and Australia are the world's largest lithium sources, the U.S., Argentina and China are also major producers. The market for lithium is heavily dominated by four companies: Sociedad Química y Minera de Chile, Australia's Talison, Chemetall in Germany and FMC in the United States. Lithium carbonate is generally sold on three- to five-year contracts from miners to refiners — including those listed above — that produce and market downstream chemicals and lithium metal. In 2017, the worldwide production of lithium (excluding U.S. production) amounted to 43,000 metric tonnes.